Birmingham have completed the double signing of Burnley winger Wade Elliott and West Brom defender Pablo Ibanez for undisclosed fees. Elliott, 32, and Ibanez, 30, have both signed two-year deals at St Andrew's. 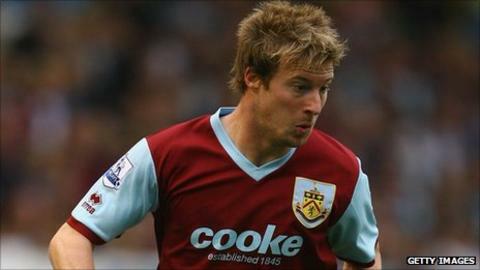 Elliott's departure ends a six-year stay at Turf Moor, during which time he scored the goal that took Burnley to the Premier League in 2009. Ibanez joined the Baggies from Atletico Madrid last summer but struggled to make an impact. He was restricted to 14 appearances last season, scoring twice and has not played for Albion, so far this term. After scoring Burnley's winner in the play-off final against Sheffield United at Wembley, Elliott then featured in every Premier League game for the Clarets, scoring four goals. These included winning strikes against Everton, Hull and Tottenham in what was the club's first season in the top flight in 33 years. He came on as an 82nd-minute substitute for Eddie Howe's men last Saturday in their 2-1 win over Derby, following reports linking him with a move away from the club. Southampton-born Elliott joined the Lancashire side from Bournemouth in 2005, and went on to make 283 appearances for Burnley, scoring 22 goals. Blues have also given a one-year deal to 18-year-old centre-half Jack Deaman, who had spent three seasons at Wrexham but was a free agent after turning down a contract offer from the current Blue Square Bet Premier leaders in the summer.